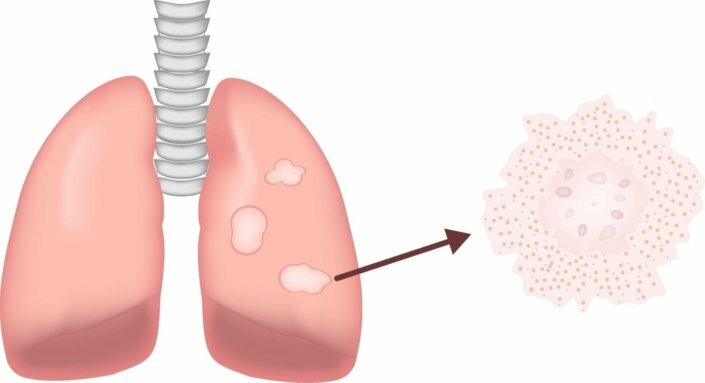 Sarcoidosis is a disease in which immune cells form small lumps, called granulomas, in your organs. Experts believe that inflammation causes these granulomas to form. The inflammation could be triggered by an infection or exposure to certain substances in your environment. Sarcoidosis is most common in the lungs, skin, or lymph nodes. If you have this disease, you may not have any symptoms. Or you may have serious problems with many different parts of your body. The exact cause of sarcoidosis is unknown. It is most common in adults between 20 and 40 years of age. It’s more common in women than in men. Worldwide, it occurs more often in African Americans and northern Europeans, especially people from Scandinavia. Sarcoidosis is not contagious. This means you can’t catch sarcoidosis from another person who has the disease. Many people who have sarcoidosis have few, if any, symptoms. (Often, sarcoidosis is found when a chest X-ray is done for another reason.) Some people will have general feelings of illness, such as fatigue, fever, or swelling and pain in the joints. Others will experience symptoms based on the part of the body that is affected. The most common symptoms of sarcoidosis involve the lungs, skin, eyes, and liver. Coughing up blood (this is rare, but it is serious). Skin sores (raised, red, firm, usually on the front of the lower legs). Scars that become raised or inflamed. Discharge from the eye or watery eyes. Sarcoidosis can cause a person’s liver to become enlarged. Some people have abnormal liver tests and/or a liver problem called cirrhosis. However, this is rare. Nervous system.The nervous system isn’t usually affected by sarcoidosis. But the disease can cause muscle weakness or paralysis, seizures, tremors (shaking), poor coordination, hearing loss, or problems walking. Sarcoidosis can cause the heart to beat abnormally. It can also cause the heart to be unable to pump blood properly. This is called congestive heart failure. Symptoms involving the bones may include pain, swelling and joint stiffness. The hands and feet are most often affected. A very small percentage of people who have sarcoidosis have symptoms involving their kidneys, such as kidney stones. Doctors don’t know the exact cause of sarcoidosis. They think having certain genes makes it more likely that a person will develop the disease. Triggers of the disease could include infection with a bacteria or virus, or contact with something in your environment, such as dust or chemicals. Work or live around substances that cause inflammation, such as insecticides or mold. Have had lymphoma, a type of blood cancer. Are of African or Scandinavian descent. Have a close relative who has sarcoidosis. To find out if you have sarcoidosis, your doctor will perform a physical exam. Then you may undergo a variety of tests, as he or she will want to rule out other diseases that can cause similar symptoms. They may order blood tests, imaging tests, or a biopsy (tissue sample) of an affected organ. Blood tests can help look for other conditions that may be causing your symptoms. Imaging tests could include X-rays, CT scans, MRIs, or ultrasound. These tests can be used to look for granulomas. A biopsy can also show if you have granulomas. Can sarcoidosis be prevented or avoided? There is no way to avoid getting sarcoidosis. If you are at higher risk for the disease, it may be better for you to avoid environmental substances that are known to trigger it. These could include insecticides, mold, or other substances. Talk to your doctor about what substances you should avoid. Not everyone who has sarcoidosis needs treatment. Sometimes it goes away on its own. Your treatment will depend on your symptoms, which organs are affected, and how those organs are working. Reduce any inflammation that may interfere with the way your organs work. Prevent permanent scarring of the lungs if they’re affected. Decrease any symptoms you have. Many medicines can be used to treat sarcoidosis. The most common are called corticosteroids. They help your condition by reducing inflammation. How long you take the medicine depends on how severe the disease is and how well you respond to the medicine. Other medicines are sometimes used to treat more severe forms of sarcoidosis. In many people, sarcoidosis gets better all by itself. Women and people who have less severe lung involvement usually do the best. If you have sarcoidosis, you should discuss your illness in more detail with your family doctor. You and your doctor should work together as partners to create a treatment plan that is right for you. There are many factors that will determine how often you see your doctor. This includes how severe your symptoms are, which organs are affected, your treatment, and if you have any side effects. Even if you don’t have any symptoms, it is important to see your doctor for ongoing care. Heart complications, such as heart failure or heart attack. Kidney conditions, such as kidney stones or kidney failure. Lung diseases, such as pulmonary fibrosis. Problems with the nervous system, including brain tumors, meningitis, or nerve pain. Most of these problems are avoidable if you get proper treatment. Don’t ignore any symptoms you are having. Stay in regular contact with your doctor and attend all follow-up appointments. How will sarcoidosis affect me? Will I need to take medicine for this condition? Can I do anything, such as changing lifestyle habits, to help prevent symptoms? How will sarcoidosis affect my quality of life?